I know some of you are like, “what is this white girl talking about with that Filipino roots stuff?” Well, not all family is blood related and some of mine is Filipino. My mom was young and single and trying to find herself. In her efforts she came across this family. They took to me like white on sticky rice. I was still a baby, less than a year old and from that time until roughly age five, I spent a lot of time with them as my “babysitters”. It never felt that way, though. I ate what they ate, I slept with them in their beds, I got picked on like any little sister would and I got loved by these strangers. I even got offended once when an out of town Auntie called me “A cute little white baby”. I had to have been around four but was adamant that I was NOT white! I was Filipino! I KNEW I was like them, I KNEW I was family. In fact, my first flower shop wouldn’t have happened if not for them. In many ways, I could never repay them for what they’ve given me. Way into adulthood, I got and still get the benefit of their love and support. My sister Traci is “Auntie Traci” to my boys and I am “Aunt Jenny” to her son and daughter. I love these people like family because they ARE family. One of the more minor benefits I got from them was a love for Filipino cuisine. I love lumpia and pancit and have been known to eat some dinuguan (also known as blood stew or chocolate meat), but I’m not gonna lie, that dish must be perfect or… NOPE. 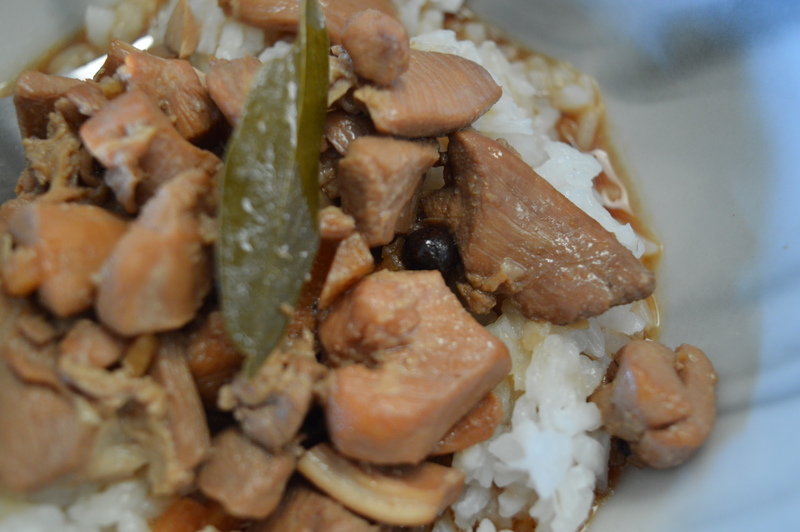 Today I want to talk about one of the staples of Filipino cuisine, Adobo. This magnificently simple and completely delicious vinegar based stew is TO DIE FOR. Seriously good stuff here, folks. Traditionally made with chicken or pork and served over rice you will not regret trying this! If you have never had it, you will thank me. If you have had it and enjoyed it, this is a legit recipe. Add a few Tbsp. oil to a hot pan, add meat and garlic, cook until browned, stirring frequently. Add remaining ingredients and bring back to a boil. Reduce heat to a simmer and allow to cook for 20 minutes or more. Serve over white rice. You may be wondering why this is a Mindful Monday post. The answer is simple. This extended family is important to me and this food makes me feel a continued connection to flavors that I learned from them. Also, it is healthy and I will be eating it for lunch all week, properly portioned of course, with an arugula salad. This is comfort food from another culture. Not mac n’ cheese and not covered with gravy. Instead, it is a tender, vinegary taste of the Philippines and a brief glance into my childhood. i love adobo!!! definitely among the best of Pinoy food 🙂 and what makes it so great is that it’s so easy to prepare!